A must for every bento collection is a compartmentalized box with removable sections. It keeps your food separate. It keeps flavors from melding. For wet dishes, it keeps the juices from running. It also allows you to reheat / refrigerate only certain parts of your meal. Take this bento for instance. 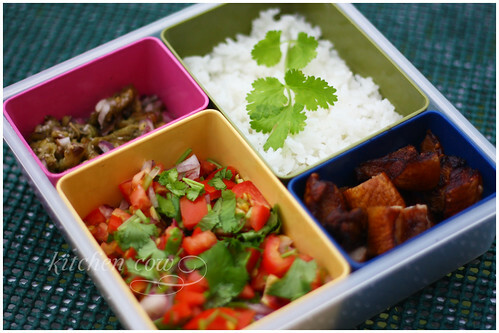 It has rice, peppered pork, tomato salad (mostly a roughly chopped salsa, really) and eggplant salad. Because we have both a refrigerator and a microwave at work, I opted to slip the whole box in the fridge, to keep the salsa chilled and for food safety reasons as well. Come lunch time, I took the rice, eggplant and pork compartments, covered them with paper towels and reheated in the microwave. This way, only the parts of my meal that needed to be served hot was hot, while the tomatoes remained chilled. Perfect! Plus, the vegetable juices remained with them, not ruining the pork nor the rice by running. Good enough reason to get a compartment box, yes? This entry was posted in bento and tagged bento, bento box, kitchencow. Bookmark the permalink. Been looking for a box like this. Does it come with a cover? May I know where you got this, if you got it in Manila? Thanks so much. Nice looking box! Where did you buy it? I tend to bring 4-5 assorted tupperwares or Lock&Locks to work just to keep the sauces separate. I’m going to echo all the other comments and ask where you got this. Haha. Did you get it here in Manila? BTW, thanks for answering my question about the dolls. After that, I did a bit more research and discovered sellers near my city. I’m not sure if you can get the exact same box there, but if something similar would suffice, why not try the laptop lunchboxes? Not sure if you can still get the same box since I bought it from a fair ages ago, but if something similar would suffice, those generic 88 peso booths in Supermarkets have them. I got some Korean-made ones from the booth in Makati Supermarket in Alabang. They’re available in square, round and rectangular. Ey, I hope I could meet you again soon!!! Everyone in Otakuboards… the oldies and alike. Me mish you guys! That might be it! I remember when I bought mine, they also had different shapes in the same colors. I kinda like the red and yellow ones I linked to more though, because the cover snaps in place, like tupperware. The one pictured in this post is kinda loose so I need to use a bento band for it. Hey you! Kamusta na?! I'm still in touch with some of the OB people. We should get together sometime. 😀 And hi to your fiancee 😀 Do you have a facebook or a multiply account? Send me naman o, use my contact form na lang so you don't need to broadcast your personal deets.